Arizona State University’s AASHE STARS rating is third in the world and second in the U.S. for sustainability initiatives. academics and research: 87 percent. campus and public engagement: 95 percent. To achieve this year’s STARS gold rating, ASU built campus and community collaborations to provide world-class education and research sustainability with the first School of Sustainability more than a decade ago. Now, 12.5 percent of ASU’s courses are recognized as sustainability or sustainability-related and 74 percent of academic departments offer sustainability courses. ASU also made significant progress in air and climate, energy, waste, and water categories, due to a variety of efforts that contributed to overall energy, waste, and water reductions over the last three years. “We celebrate this recognition. 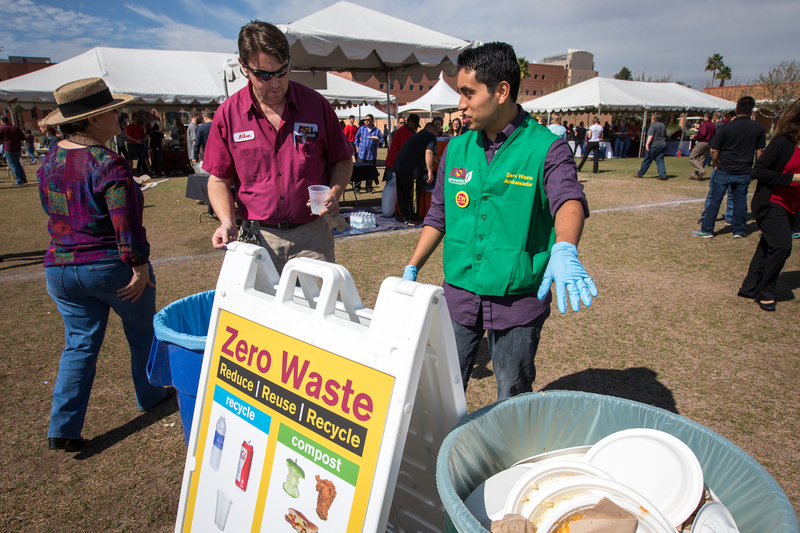 However, we will continue to expand our efforts to ensure ASU remains a global leader in sustainability,” said Mick Dalrymple, University Sustainability Practices director. ASU researcher gets military funding to enhance learning, retention up to 30%. The Arizona State University neuroscientist has been awarded funding for a four-year study to develop a method of brain stimulation that may boost learning and retention up to 30 percent. The money comes from the Army’s Defense Advanced Research Projects Agency, which is the bureau behind technology including GPS, the internet, stealth tech and drones. The brain will be stimulated by a method called Transdermal Electrical Neuromodulation so it learns more quickly, more efficiently and with increased recall. Certain neuromodulators — chemicals that affect transmission between cells — have broad physiological impacts such as arousal and attention. If it’s 2 a.m. and you hear a door open in your house, you will be alert, processing information, making a decision and taking action. That’s norepinephrine working. Sensory systems have access to the brain stem nucleus, the locus coeruleus, which releases norepinephrine. Helms Tillery will be looking for changes in behaviors in restricted circumstances, doing facial recognition, sensory motor mapping (responding to a visual signal with an action directed toward that signal) and sensory processing. “There is some evidence your senses can be sharpened using the same mechanisms,” he said. If you give some kind of stimulation, like a touch, a sound or a flash of light, there is a change in electrical activity that can be measured in the brain. “We’re going to see if we can change that electrical signature by pairing it with this cranial stimulation,” Helms Tillery said. He will record areas in the brain related to vision, perception and decision-making. “We’ll see if we can change the physiology of those areas with the stimulation,” he said. DARPA wants to see a 15 percent increase in performance in the first three years and a 30 percent increase in the final two years of the project. To quantify that, Tillery is teaming up with a group at the Air Force Research Laboratory who studies drone teams. As brain-stimulation techniques are developed, Helms Tillery will be working with them to improve the drone teams’ performance. He will also be working with the U.S. Army Research Institute of Environmental Medicine in Boston. They have an elaborate virtual shooting range with carbines that fire pneumatically, so they feel and fire like a real weapon. Most of the performers who come through the program are high-level marksmen. Improving their performance is difficult. The Army has been doing studies with sleep deprivation, to deck their performance.